1. Prime area with off white Faux Effects SetCoat. 2. After SetCoat is dry trowel Faux Effects AquaStone through Victoria Larsen's tile stencil. Let dry overnight. 3. 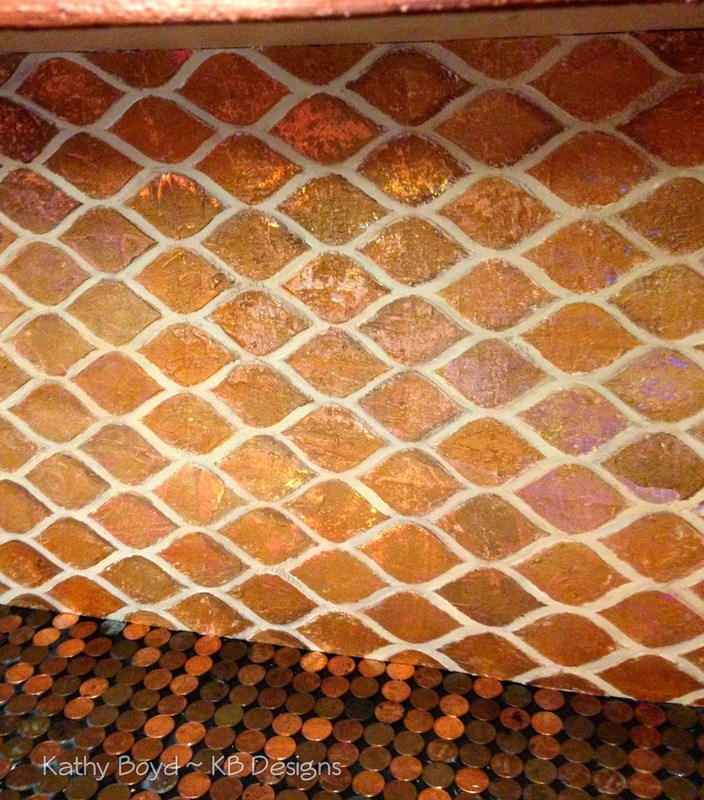 Randomly pounce on tile sections (leave stencil on) Faux Effects Tundra Gold MetalGlow and Rustoleum Metallic Copper Penny. Let dry. 4. Apply Wunda Size to tile sections and after it tacks up (roughly 30 minutes) apply foil. I used Copper Rainbow. If you have not used decorative foil before, be sure that you lay the foil color side facing up. Use a stiff brush or a scrubby pad to rub the foil on the tiles. 5. To protect the finish I recommend using Sherwin Williams ArmourSeal 1K or Modern Masters MasterClear Topcoat.